Michelle B. Assor is unlike many people out there: She’s fond of snakes. She actually likes them enough that she made them the star of her own fantasy novel series. 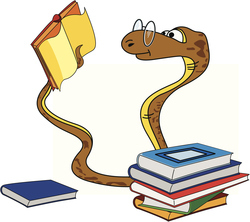 The first book is called Snaygill: Slithery Temptations. “At birth, princes Ophis and Neddris barely escape death from a feathered earruda. They survive, and are destined to inherit the crown of Snaygill, a reptile-driven kingdom that has never before seen the presence of mankind – and is instead inhabited by crafty, mischievous snakes. As the brothers set off on the often bumpy road toward adulthood, they abandon the regal rules and find themselves confronted by temptations that lurk around every corner. Along their extraordinary quest, they attend a deceptive school, engage in forbidden journeys and meet alluring characters who contradict everything they thought they knew about the world. They even fall in love…” Her web site has more on this and other books that she’s working on.